Sunday, April 21 at 8:30 & 10 a.m.
No dress code: Wear your new Easter outfit... or not. Your call. High energy music from our live worship team led by Nick Slayton our worship leader. Free coffee and donuts. It's good coffee, too. There's fruit as well if you don't want a donut. A welcoming, friendly atmosphere for you, your friends, and family. A fun experience for your kids. For your littlest ones, we have a great nursery filled with fun toys and staffed by loving volunteers who have been background checked and trained. This is for kids from birth to age 3. The nursery is open before the service begins, so you can check in your infant or toddler as soon as you arrive. Home Plate Detroit 2019 offers a great opportunity to enjoy Saturday, June 8 at Comerica Park. Tickets may be purchased by individuals, but buying tickets as a CBC group makes it more likely the group would be seated together. Group ticket purchase: Give your payment to Rod Perkins before March 18. Include $1 extra per ticket to cover postage and handling. Prepayment is required. Kids grades 4 - 9 are going to Camp Barakel June 18 - 24. The cost is $250 and which includes bus transportation from Flint. A $50 deposit is due when registering. The weeks fill up fast, so register as soon as possible to avoid wait lists. Registration is open now at campbarakel.org. Live worship music led by Nick Slayton our worship leader. The whole church is invited on March 27 to Rollers Skate Park for a fun night of roller skating! AWANA and small groups will not meet on this night due to Spring Break. Come roller skate with us instead! This event is at Rollers Skate Park, 19750 Sumpter Rd, Belleville, Michigan 48111. Get ready for AWANA Grand Prix 2018 on Sunday, March 24 at 5 p.m. Anyone can make and race a car, children or adults, even if you’re not involved in AWANA. This is an all church event and free food is provided, so plan to come and enjoy the race and the fellowship, even if you don’t make a car or have a child in AWANA. Cars are available for purchase on Sundays and Wednesdays in the lobby. contact Doug McIntosh for more information. The world's largest Christmas project of its kind, Operation Christmas Child, uses gift-filled shoeboxes to demonstrate God's love in a tangible way to children in need around the world. While you are school shopping, would you be able to pick up some extra supplies for some needy children? Use them to pack a shoebox or donate them. A box to donate will be located in the cafe. Monday, November 12 from 5 - 8 p.m.
Tuesday, November. 13 from 5 - 8 p.m.
Wednesday, November 14 from 2 - 5 p.m.
Friday, November 16 from 2 - 5 p.m.
Saturday, November 17 from 10 a.m. - 2 p.m.
Sunday, November 18 from 1 - 4 p.m.
Monday, November 19 from 9 a.m. - 12 p.m. Donations Will NOT Be Accepted! Come to Calvary Bible Church on Saturday, September 22 anytime between 9 a.m. and 1 p.m. for an absolutely free, no donations asked for or accepted, no strings attached car wash.
We want nothing from you; we just want to serve our community. We’re located on Carpenter Rd between Bemis and Willis. 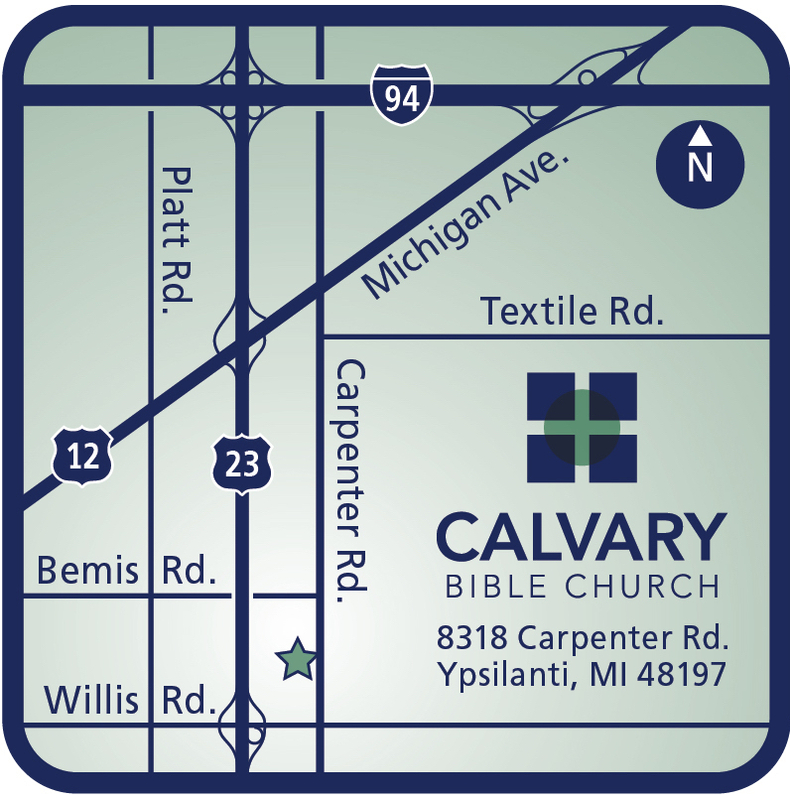 Our address is 8318 Carpenter Rd., Ypsilanti, MI 48197. Click here (or the map to your right) for turn by turn directions. AWANA resumes on Wednesday, September 19 at 6:30 p.m. Click here for more information about our AWANA clubs. AWANA registration will be held on Wednesday, September 19, 2018 and again on Wednesday, September 26, 2018 starting at 6:00pm in the foyer of the South Hall. Doreen McIntosh and other volunteers will be available to register and/or accept payment for all returning and new AWANA clubbers. Dues: $1.00 per night or $20.00 per year. Family dues are $50.00 and apply to families with 3 or more registered clubbers. Please feel free to contact Doreen McIntosh if you have any questions concerning AWANA registration or costs. Checks and/or exact change are appreciated! Our next adult Calvary Class will explore the book of Hebrews. The teacher is Jeff Hatto and the class will meet in room 133. This class begins on Sunday, September 9 at 9 a.m.
Children's Calvary Classes continue as well. See the bulletin on Sunday for a complete list of classes and locations. Our annual church picnic is scheduled for Sunday, August 26, right after the worship service. Once again this year, we will have the picnic at Rolling Hills County Park at the Woodland Pavilion. Please bring a side dish or a dessert, along with any needed serving utensils. The church will provide hamburgers, hot dogs, and beverages. Feel free to bring yard games, lawn chairs, and anything else that will make the picnic more fun. You will need to sign up and get an entry pass from us to be admitted to the park. Each entry pass that gets used will cost the church $5, so please only take one per family. If you have already paid for a county park pass, please use that instead of our customized entry pass. If you're planning to come, you can sign up in your response card on Sunday or anytime in our app. If you want to learn more about Calvary Bible Church, plan to attend our Welcome to Calvary Bible Church seminar on Sunday afternoon, July 29 from Noon-4 p.m. in room 127. A free lunch will be provided. This seminar will discuss what we believe as a church, introduce you to our church's ministries, teach you about baptism and more. Please sign up in your response card on Sunday or by contacting the church office at 734-434-4044 or info@calvary-bible.org. Vacation Bible School is scheduled for Monday July 16 through Friday July 20 from 6 to 9 p.m. Children starting at age 4 and going through those who just completed 5th grade are welcomed to attend.